Since the launch of the iPad, certain segments of the analyst community have consistently compared the tablet market to the iPod-dominated music player market. After Android tablets made a major market share push this year, this theory lost a few followers. However, some analysts remain still argue that Apple's pricing strategy with the iPad will be similar to that of the iPod line, using the oft-quoted "price umbrella" train of thought. Let's analyze this argument with the help of pricing and margin data. I have previously shown that market share patterns in the tablet market have basically mirrored those we previously saw in the smartphone market. While it is certainly true that the distribution and pricing patterns for the iPhone were very different from the iPad, carrier-induced distortions have actually helped Apple. Having said this, the "job to be done" by the iPad (i.e., computing) and pattern of modular competition is far more similar to the iPhone than the iPod. The iPod only faced integrated competitors without the help of a modular ecosystem, which ensured Apple's dominance. 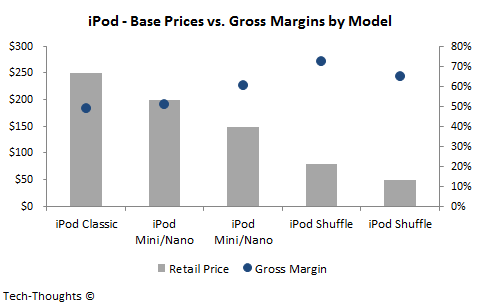 Having understood the difference in competitive dynamics in the two industries, let's take a look at the pricing & margin decisions Apple made on successive iPod and iPad models. In the chart above, gross margin has been calculated based on IHS/iSuppli's BOM & manufacturing cost estimates. The costs exclude those related to software, IP, accessories & packaging, which means that actual gross margins reported by Apple were likely to be lower than this figure, but should still be proportional. For the iPod models mentioned, I compared the price of the base model with the lowest gross margin that Apple made on any generation of the product. 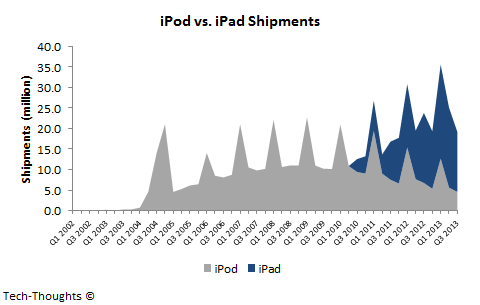 The dropping prices of successive iPod models seemingly show Apple eliminating the "price umbrella" for competitors. However, Apple's gross margins on subsequently cheaper products were actually greater than those on previous products. This implies that Apple's pricing strategy with the iPod probably had more to do with margins than a "price umbrella" for competitors. 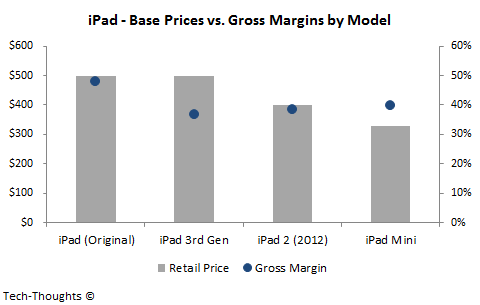 The chart above compares the retail prices of various iPad models with their gross margins, calculated using the same methodology as for the iPod. The difference between the two charts is quite stark. While Apple moderately reduced prices on iPad models, the margin on those products has remained roughly flat. The difference is that the "job to be done" by the iPod was fairly limited, which allowed Apple to cut major component costs aggressively. This enabled Apple to reach successively lower prices even as it made more lucrative margins. However, the "job to be done" by the iPad (computing) involves a much wider range of tasks and, therefore, costs of key components like the display are much more difficult to reduce. In addition to this, the advent of modular competition ensured that Apple could not keep increasing margins on subsequent products like the iPad Mini. This makes further price cuts on the iPad considerably more difficult. This data clearly shows that looking at a company's product pricing and a "price umbrella" in isolation isn't particularly helpful. Pricing strategy needs to be put in context with margins and the competitive structure prevalent in the industry to extract any meaningful insights.